Roulette is a very popular and entertaining game that’s been around since the 17th century. Not only that, but it’s a pretty easy game to pick up and learn. Originating in France, it didn’t take long for this game to make it around the world for everyone to enjoy, especially when it became available to play online. Over the years there’s been some different variations made to the game mainly to increase the casino’s house edge, however the basic fundamental of the game remains the same. The three major variations to roulette are the French, European and American versions, with each of them having their own appeal. One of the great things about roulette are all the different types of bets you can make to create your own personal strategy inside the game. You have anywhere from low risk bets that give you a higher probability of winning, but offer a lower payout for your wins, to the high risk bets where you have a lower probability of winning, however the potential payouts are greater. One of the deciding factors when choosing one of the two depends on your bank roll and how much money you’re willing to risk. Whatever it may be, the game of roulette has two different kinds you can use. With that said, continue reading on so you can learn both types, inside bets and outside bets as well as the odds and payouts for them both. If you’ve ever played roulette before, then you’re probably familiar with outside bets. If you’re new to the game, no problem, that’s what will be discussing right now. For starters, roulette outside bets offer a lower payout when winning, however your chances of winning are better. In fact, if you like playing more conservatively so that you have a longer gaming session, then this could be a good betting strategy for you, and is especially good for those who are new to roulette. One of the pros when making an outside bet is that you can take advantage of the “la partage” and the “en prison” rules. These rules give you the chance to earn some or even all your money back whenever the ball lands on zero after spinning the wheel. They also help increase the player’s edge when trying to win. The outside bet is based on a broader category of numbers; you’re betting on a certain kind of number, rather than a specific one. With that said, we’ll be going over five different bet types you can make on the roulette table. Column Bet uses 12 numbers in a column. Since it involves 12 numbers in a row it nearly covers 1/3 of the wheel and the payout is 2-1. A winning payout is 2 to 1 and the table coverage for European roulette is 32.4% and 31.6% for American roulette. Dozen Bet allows you to bet 12 numbers for each spin. The “1st 12” box, the “2nd 12 box” or the 3rd 12” box. A winning payout is 2 to 1 and the table coverage for European roulette is 32.4% and 31.6% for American roulette. Bet on Color includes all of the numbers that are red or all of the numbers that are black, and the bet is made on all the red or all of the black ones. A winning payout is 1 to 1. This specific bet is a very basic, especially for new players. Bet on Odd/Even contains either all of the even or odd numbers, and the bet is taken place on either all of the even number or all of the odd numbers. A winning payout is 1 to 1 and the table coverage 48.6% for European roulette and 47.4% for American roulette. Keep in mind, that the 0 and 00 slots are not part of the even or odd bets, therefore if you make one of these and the ball lands on 0 or 00, you will not win, unless you’re playing on either a French or European roulette table. Bet on Low/High is where you select either all the low or high numbers and place your chips on 1 – 18 or on 19 – 36, which is close to half of the numbers on the wheel. A winning payout is 1 to 1. Inside bets are all the possible ones you can make located on the inner section of the table. For example, placing your chip on a single number would be considered an inside bet. Unlike the outside ones we discussed above, roulette inside bets offer a higher payout with a lower chance of winning. Taking this into consideration, this particular betting style is probably more suitable for those who like to take more risks when playing and have a larger bank role. Below we’ll discuss the six different inside bet types. Straight Up Bet is when you put a chip on top of a single number. A winning payout is 35 to 1. One example of a straight up bet is when you place your wager on Red 18, therefore the ball needs to land on this same exact number and color in order to win. It’s a simple bet, yet the chances of winning are a lot more difficult, but the potential rewards can be big. Split Bet is a double straight up bet when place your wager on two adjacent numbers, which is between the numbers. For example, 15 and 16. The winning payout for this bet is 17 to 1. Street Bet is where there are three numbers appearing in a row and the wager is placed at the end of the row. For example, 7, 8, 9. A winning payout is 11 to 1. Corner Bet is similar to the street bet except you’re betting on four numbers at a time instead of three. Therefore, this bet contains a group of four numbers where the wager is placed on the corner to where the four numbers touch each other. A winning payout is 8 to 1. Five Bet involves the numbers 0, 00, 1, 2 and 3, and the wager is placed just at the corner next to 0 and 1. Since it involves wagering on 00, this bet can only be used on American roulette tables. A winning payout is 6 to 1. Line Bet involves two rows containing 3 numbers each, where the wager is placed right at the end of the two rows, between each other. A winning payout is 5 to 1. Congratulations! If you’ve read this entire article, you should be ready to conquer the roulette tables. Now you can decide which style is suitable for you, so you can spin the wheel and have loads of fun. Whether you’re playing at one of the land based casinos or online, at the end of the day, it’s up to you to decide which type of bet you’ll be making. Again, take into consideration your bank roll and how much money you’re willing to risk. If you prefer taking more risks for a chance to win some high payouts, then go with outside bets. If you want to go the more conservative route, then go with the inside bets. If you’re not sure, or you just want to play for fun, come check out our selection of roulette tables at Caesars Casino online. 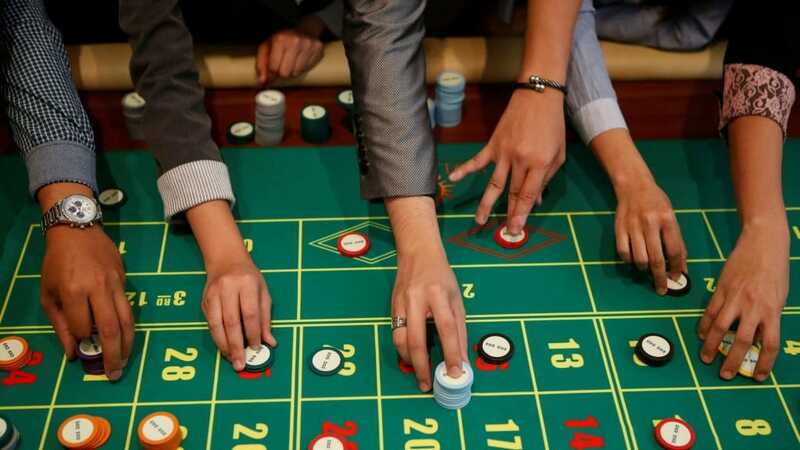 We offer different types of roulette tables that are good for beginners and those who have more experience, and of course those who want to take more risks than others.